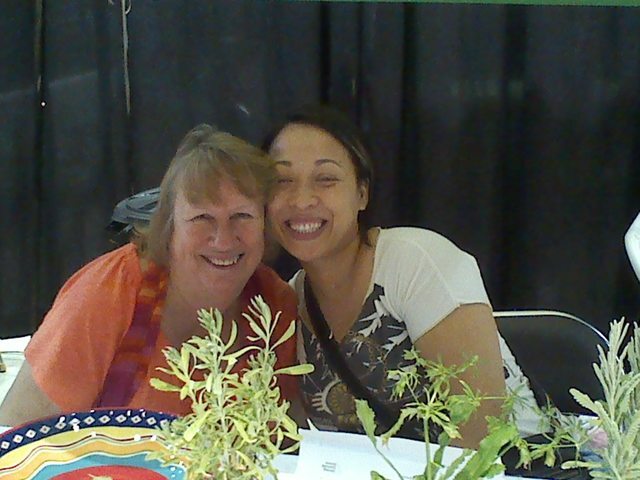 Nancy Seaberg and Lilly Bui (two members of Loving Garland Green) at the Healthy Living Expo in Garland on September 27, 2014. Another great environmental event here in Garland sponsored by our City has come and gone. It was a beautiful day for sharing with our neighbors. This annual event at the Curtis Culwell Center, 4999 Naaman Forest Blvd, featured activities, exhibits and information intended to help us live healthier lives in a sustainable environment. Garland is a lot greener than many of our neighbors in the DFW area may realize and we are becoming greener by the day. Perhaps Mayor Athas will want to consider proposing a name change from "Garland" to the "Emerald City" as he is one of our city leaders who heartily supports activities that lead to healthier, sustainable lives here in Garland. Members of Loving Garland Green were honored to be featured as part of the "Stop and Learn" educational presentations that were part of this event. Our three, fifteen-minute presentations included: Seeds--Saving and Planting; Organic presented by Liz Berry; Mosquito and Pest Control presented by James Roney and assisted by Gene Rodgers; and Garden Landscaping with Lasagna Gardens presented by Charlie Bevilacqua. Each presentation was well- attended and well-received by our audiences. We handed out over 100 free seed packets. The winner of our garden pot give-away was Joyce Bach of Garland. Handouts and Posters for Loving Garland Green's Stop and Learn at the Garland Health Expo--September 27, 2014. WE SURVIVED AND EVEN THRIVED. 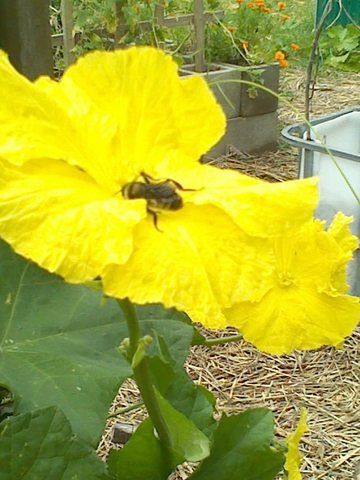 The bee on one of the loofah blossoms in the Garland Community Garden is a symbol of our success. Not only are we now feeding bees, we are also showing, by example, there is money to be made from growing plants. At the last Garland Marketplace we made $28 dollars from the sale of 14 loofahs grown in our garden. Last fall we made almost $1,000 from the sale of pecans that we harvested from the Garland Community Garden. Hard to believe, but Loving Garland Green held their first meeting almost a year ago on October 17 at my home. Even harder to believe is that I've kept my home clean enough to host approximately 50 meetings over the past year. Now that is dedication! Prior to officially organizing as Loving Garland Green, we were a committee that I organized by posting a query on NEXT DOOR (an online social media site) to see if anyone was interested in participating in the establishment of a community garden in Coomer Creek. Our membership as well as our garden today includes all residents of Garland and our garden is the Garland Community Garden. It belongs to all residents of Garland. None of this would have been possible without people coming together at our local grassroots level. The message below was the second query I sent through Next Door regarding the establishment of a Committee. It was sent on October 14, 2013. We held our first meeting on October 17, three days later, in my home. Eight people were in attendance. Today we average 18 members at our weekly meetings and we currently have 22 members registered. I'll post a few links to the more significant milestones of our development. My posts on NEXT DOOR, EAT GREEN DFW, and my emails provide good records of our journey. HAPPY BIRTHDAY LOVING GARLAND GREEN! I started my celebration today. I went down to the garden and brought a recycled planter that Robert Opel, one of our founding members dropped by my home yesterday. It's a metal fire pit with lots of holes in it. Robert found it on someone's curb. True to our permaculture roots, we are enthusiastic about re-purposing objects. I took it down to the garden and planted some mums and pansies in it this afternoon--thus making it Loving Garland Green's first birthday present (unless you want to count all the great plants that Nancy Seaberg planted in our Seniors Garden on Monday). Food security, affordable housing, and job creation are all challenges that face the citizens not only of Garland, but of urban communities all over the USA. The good news is that communities like the one in LA mentioned in my post below are coming together all over the USA to improve conditions at a local and even micro-local (neighborhood) level. What I am hoping to build with the Coomer Creek neighbors and other Garland citizens who choose to participate in the planning efforts for the Coomer Creek Community Garden is the creation of a people-powered organization with a mission much broader than providing garden plots for individual citizens (although that is part of the plan and a worthy part). Call me at 972-571-4497 or email me at eebemma@yahoo.com if you are interested in being part of this committee. It looks like the consensus is Thursday night at 7pm--either this Thursday Oct. 17 or next Thursday Oct 24. I'll let everyone know tomorrow. October 24, 2013 Planning Committee Met There were 12 people at this meeting. I blush when I read our ambitious plans. But that's one thing to remember with starting any grass roots movement: Aim for the stars and you may get to the moon your first year. Aim for the moon and you might not get off the ground. I am not in agreement with folks who admonish others to be "realistic" because after all beginning with a limited and timid vision builds a fence around your potential. December 1, 2013 Being the Example with Loving Garland Green I read this article and I'm embarrassed and feel like a hypocrite. In this article I mention a dear friend. Delores Elder Jones and I'm reminded that I need to return a phone call from her from over a week ago. January 14, 2014 Mayor Athas Visits Loving Garland Green Mayor Doug Athas has been one of our biggest and most faithful supporters. 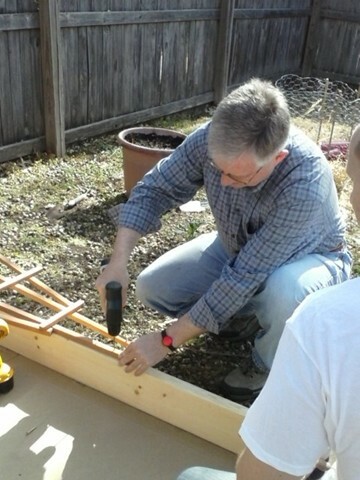 March 2014 Mayor Athas assisted at the installation of Loving Garland Green's first "Another Urban Garden." April 29, 2014 - A Day of Gardening in Garland Wow! It's fun to look at some of these photos of the garden and see how far we've come. May 3, 2014 Installation of a Keyhole Garden donated by Leon Smith of Keyhole Farms During the last week in April I attended a tour of keyhole gardens in Clifton Texas. Leon's Keyhole Garden Farm was on the tour. I asked him if he would donate one to Loving Garland Green. Within 3 days Leon shipped one to us. And there's lots more in our future: This Saturday, for example, we hope to see you at the Healthy Living Expo. In addition to our stop and learn presentations, we will also be giving away a free pot for a container garden. Then on October 8 at 6 PM we hope you'll come down to the garden (4022 Naaman School Road) for the installation of the multicultural garden section and to also help us celebrate the birthday of Loving Garland Green. On October 18 we will be in downtown Garland for the Autumn Fest. After that we have the November 1 Mosaic Festival where we will have a booth. Our last event on our calendar is the November 8 Mistletoe Event in downtown Garland. A few months ago on June 14 I wrote an article titled "Nothing says survival quite like Pokeweed. I only learned of Pokeweed in June of this year--just a few days past my first year anniversary as an urban gardener. 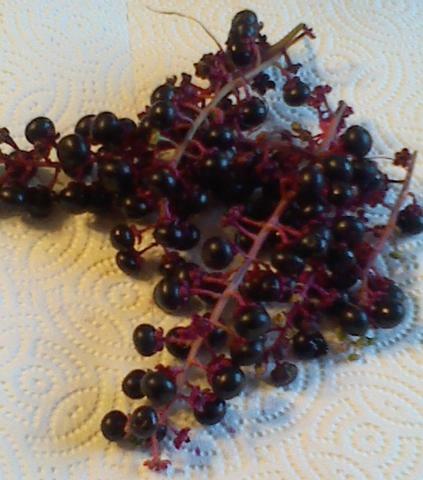 Pokeweed is just one tiny example of why one would require several lifetimes to learn all there is to learn about gardening--and even at that it is doubtful if one could retain it all. This one lowly American weed has a rich history all its own. Today Charlie went after all the volunteer Pokeweed in his yard with a vengeance. He has plans to replace these interlopers with exotic (but hardy) hibiscus bushes that he recently purchased at Bruce Miller's Nursery..
By now, since it's fall, the Pokeweed have mature luscious red berries. (No they are not edible.) To Charlie's credit, he allowed the weeds to remain for me until the berries fully matured. While I had no intentions of eating them, I was curious to mash them up and use them as a dye as American Indians once did. Today was the day. 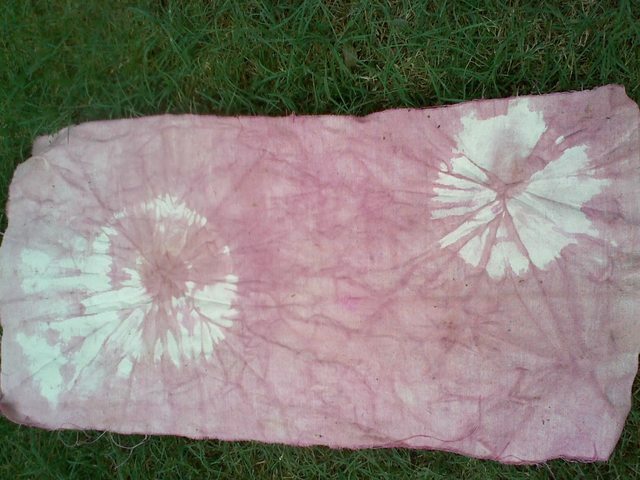 I probably should have gotten on the Internet and found recipes for making dye from pokeweed berries but I was too lazy. Instead, I simply mashed up the berries, put a little water in the pot, and stuck some canvas in. I was a little disappointed as the color is not nearly as bright as the color of the mashed berries. 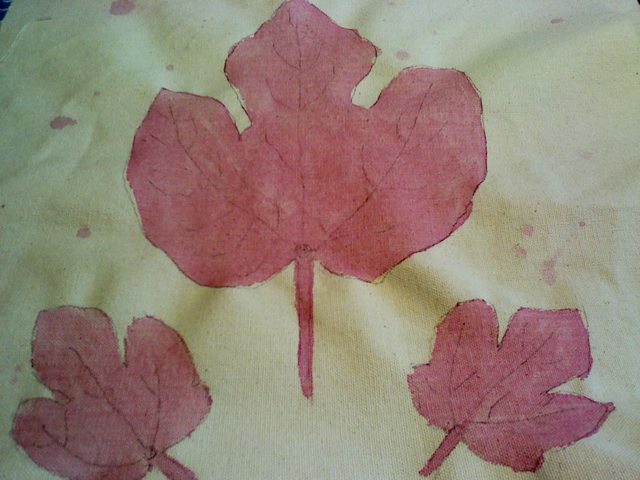 I tie-dyed one canvas and painted leaves with the pokeweed berry dye on the other canvas.